BlackBerry is not giving up on its mobile division yet. After throwing itself into the competitive Android world with a Priv, the Canadian tech giant released a BlackBerry DTEK50 earlier this year. After a series of leaks and rumors, the company has finally added its third Android-powered device that goes by the name BlackBerry DTEK60. Where the hell the company is getting these names is a mystery, but on the brighter side, this is one phone you would be proud to carry around. The DTEK50 was ideally meant for the entry-level market, however, the new DTEK60 is a higher end model, featuring better specs and features than what its predecessor rocks. The phone can be bought from the official BlackBerry website for a price of $499. This is an unlocked version and even though the carrier support is still unknown, the phone should work with most carriers. If you have come across the Alcatel Idol 4S, you will get along quite easily with the BlackBerry DTEK60. It has a roomy 5.5-inch QHD screen that is housed in a metallic frame and a dual-glass panel. Under the hood, the high-end DTEK60 carries a Snapdragon 820 SoC that is paired with an Adreno 530 GPU, just like what you find in other Android flagships. As noted earlier, the DTEK60 is one device you will love walking around with. It has a high-resolution 21MP snapper on the back that promises some of the best pictures and videos in the smartphone world. In addition, the huge 3000mAh battery promises to push you throughout the day and in case of the need to quickly charge it, there is support for Qualcomm’s Quick Charge 3.0 technology. Like many other smartphones in 2016, the BlackBerry flagship comes with a USB-C port as well as a fingerprint scanner on the back. BlackBerry has added a unique, customizable side button on the phone as well. Even though Android Nougat is available, no OEM is ready to join LG in releasing devices with the new OS out of the box. 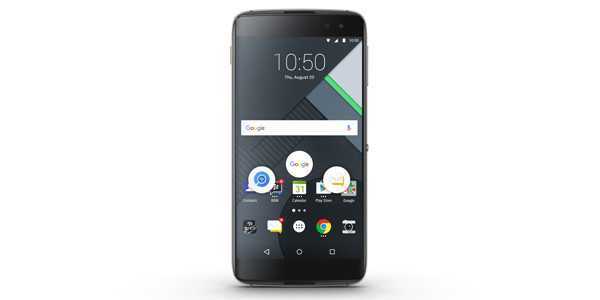 Instead, the BlackBerry DTEK60 will come with Android Marshmallow, but a Nougat update should follow soon. As usual with BlackBerry devices, the security aspects of the phone are being touted as the best for any Android device. You also get the company’s suite of productivity apps on the handset, but this time, there is no physical keyboard like the Priv. Apparently, BlackBerry has plans to mainly focus the DTEK50 and DTEK60 devices to business and government customers. But this doesn’t mean you can’t buy one for your own personal use. It really does look promising. Not to age myself, but I remember my Blackberry hardware fondly… and groaned through their entire decline. If it was slightly smaller (5″ fits in men’s dress and business-casual pants pockets, including motorcycle commuting on nice days) I’d consider it. If it had a swappable battery (if they are truly targeting the professional market – including business travelers – it’s a must) and swappable storage (a nice-to-have to swap between “personal life” mode and “work/travel” mode). So close – but looks like I’ll still be waiting.